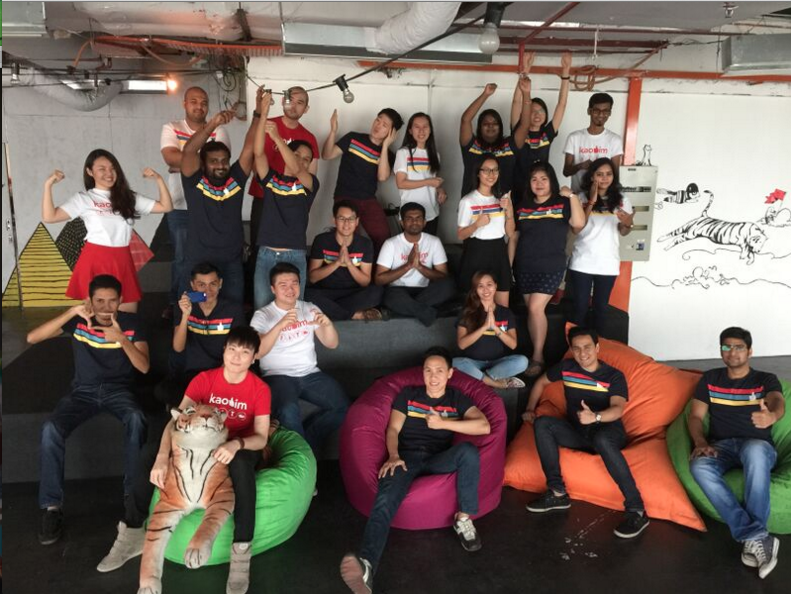 They worked around the clock to the pick up the necessary skills that were required to execute their idea by working closely with notable figures in the startup community like Khailee Ng and they managed to officially launch Kaodim on the 3rd November 2014. 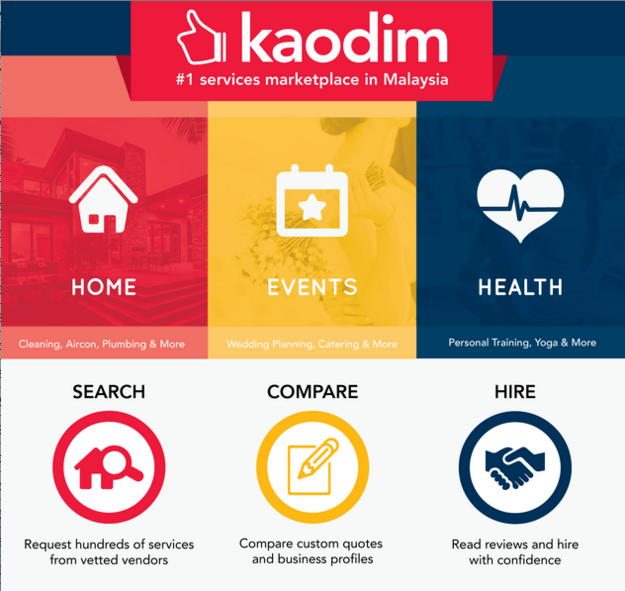 Kaodim—“Gao Dim” meaning “take care of it” in Cantonese—is essentially an e-marketplace that connects the everyday consumer with local service providers such as handymen, general contractors, personal trainers, cleaners, among others, so that they can take a step back while the experts fulfill their service-based needs. From the time they first started, US$10 million worth of sales have exchanged hands through the platform and they’ve connected more than 20,000 customers with local service providers in just 4 months. Since then, Kaodim has become one of the few platforms in the region that has been able to grow their business by 60% month-on-month while remaining fully monetised. The platform has been able to prove their concept to local service providers by not charging them immediately when they first launched. This allowed local service providers to build trust in the platform without risking any of their financial resources and it allowed them to decide whether they see value in Kaodim and if they want to pay for the service. Since then, they’ve expanded to Singapore (read about it here), gone mobile and they now have a new milestone to commemorate. Given that Kaodim currently operates in five cities including Kuala Lumpur, Penang, and Johor in Malaysia, Metro Manila in the Philippines, and Singapore, Kaodim announced today that they raised their Series A round of financing led by Venturra Capital. The Series A round of financing is worth US$4 million. Along with Venturra Capital, BEENEXT, and existing seed investors 500 Startups and East Ventures also participated in the round. “What we’ve achieved since then has impressed investors as evidenced from them participating in this funding round. With US$4 million, we expect our GMV and the number of requests we process to grow significantly, fulfilling Kaodim’s mission of helping local businesses thrive,” he added. The funding will be used to launch their e-marketplace in other major cities in Southeast Asia and it will allow them to expand their product offering to include other services in the home, lifestyle, wellness, education and business categories, among others. Venturra Capital is a venture capital fund that’s focused on Southeast Asia and they have a strong collection of resources and networks that are of great use for Kaodim, especially since they are looking to make an impact in the diverse Southeast Asian markets. This partnership will definitely supplement their ambitious efforts to enter and capture new markets through localisation. They’ve branded the platform as Kaodim.sg in Singapore and as Gawin.ph in Philippines (“Gawin” means “do it” in Tagalog). Localisation allows them to appeal to local customers and it helps them gain the “top of mind” advantage in these new markets. Their tech infrastructure will allow them to handle thousands of requests from end to end while maintaining service quality, speed, efficiency and accountability at any given point in time. Kaodim is currently available for both users and services professionals on all devices via their web apps and mobile apps on iOS and on Android. This introduces the concept of mobility into the process cycle and helps service professionals to receive requests while on the move. 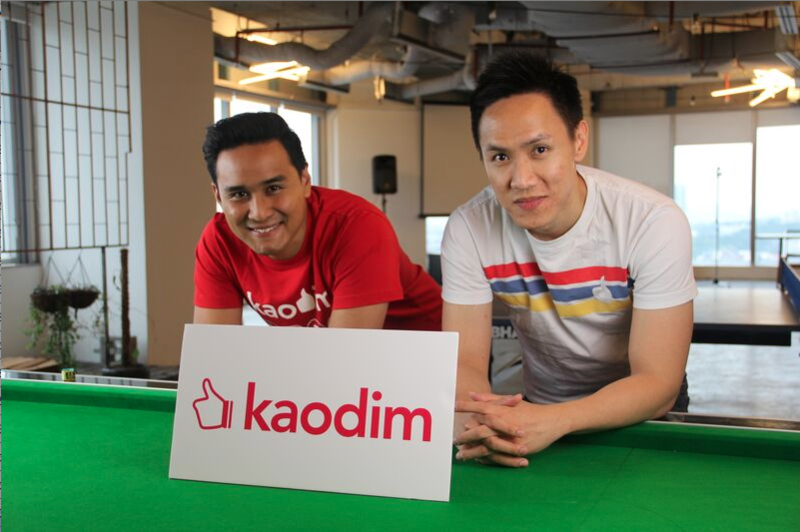 While this has been a major focus for Kaodim in both Malaysia and Singapore, they continue to maintain their presence on the web, which is how they started. “Providing both web and mobile options continues to be important to us, as we believe that a mobile-first or mobile-only strategy for our business model will isolate large segments of users who are very much in our target market. We’ve observed that several startups which initially launched with a mobile-only strategy have in recent months launched on web as well, a sign that web access remains important to our region,” Jeffri said in an interview with Vulcan Post. While this round of financing will definitely bolster their growth efforts, the fact of the matter is that there are plenty of competitors that operate in the same space. In Malaysia alone, we have the likes of ServisHero, RecomN.com, Page Advisor, among others that compete for the attention of consumers. The presence of such alternative services inherently cancels their “first mover” advantage that brands hold close to their hearts. The success of Kaodim in new markets depends on their brand image and whether they’re able to generate enough trust between the brand, its service providers and the customers. For example, a Malaysian sole proprietor electrician called Sri Shashti Electrical gained 350 lifetime clients in just 7 months from the platform. Another notable example would be general handymen and plumbers like Balisya Trading who only completed 150 jobs at the end of the year before joining Kaodim but after teaming up with Kaodim, the number grew to 1,545 jobs. Kaodim even has a guidance and support system in place for their service providers that help them transform their financials and assists them in ensuring that they consistently deliver excellent service quality, which in turn boosts their reputation even further. Continually delivering such value for both their service providers and their customers will ensure that there’s a steady flow of demand and supply for the platform. Editor’s note: The original title for this article was “This Startup Handled US$40M In Sales In Less Than One Year – Here’s Why”, however upon further confirmation, the title has been updated to reflect more accurate information.